Unspoken have had quite a journey of late. Signed to Centricity Music, Unspoken have come a long way since their 2012 EP release 6 years ago. Fusing together hip hop, pop, soul, funk, acoustic, praise and CCM, Unspoken may be one of today’s most unique, energetic, interesting and powerful, even underrated bands that have spawned to life over the last few years. Mixing together a little bit of Salvador, Jimmy Needham, Shawn McDonald, Dara MacLean, Chris August and newworldson together to form one of the most engaging and life-filling music I’ve heard in years, this 5-piece band that formed all the way in the Dominic Republic are certain to continue to unveil to us great music with a Latin vibe and flair, with their new EP titled Just Give Me Jesus out on Friday. Since releasing their 2016 chart-topping successful sophomore Centricity Music album Follow Through (that spawned the radio hits ‘Miracle’, ‘The Cure’ and ‘Higher’, and even delivered a colourful and ingenious music video in ‘Open the Clouds’! ), lead singer Chad Mattson and the rest of the band have reminded us that soul-pop has a place in today’s current sonic landscape and the industry of CCM at the moment. For the sound delivered by Unspoken through not only this new EP but throughout their entire musical catalogue is a fresh and invigorating one, easily enjoyed and needed to be heard- for us to understand and realise that often what can energise and revitalise is something new, which is what Unspoken has been bringing over the last few years with their music! Just two years after their critically acclaimed album Follow Through, Just Give Me Jesus EP seems a little short, though what it lacks in track listing it makes up for in fervent honesty. 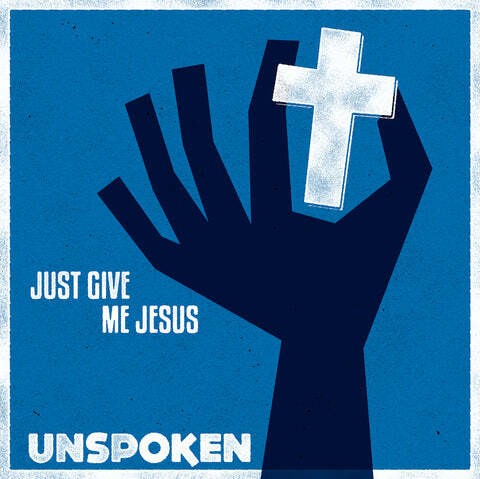 The title track itself is one such a song that can be pondered and reflected upon as we ask a similar question- when everything is stripped away, can we state the words ‘give me Jesus’, when everything else isn’t as it should be, when we’re in a Job-type situation? Maybe, maybe not. Nevertheless, the gospel choir littered through the track gives more of a sombre and reflective atmosphere as I ponder such profound and poignant lyrics that these men have shown to us. As the song delves deep into the issue of comparison, and how in order for us to declare this song wholeheartedly, we must first need to lay down all of pride and comparison, to say ‘I don’t care if this person has this or that, that as long as I have Christ, I am whole and complete!’; we realise that setting aside any of our agendas, in favour of the Lord’s, can be difficult. Because we’ve all known that comparison is very much inherent in us- and it is the thief of joy. And so this song can hopefully be a reminder to us that Jesus is all we need, more than work, money, fame, even more than the next guy we’ve been idolising and envying for a while. We run after the heart of Jesus, and everything else will follow. Throughout the rest of the EP, Unspoken have continued to press into themes and issues that may or may not have been discussed at the fore over the last while, as we know that sometimes, a song can have the permission to discuss issues that a general discussion can’t. ‘You’ve Always Been’ is an encouragement if ever there was one- and a potential radio single #2 after ‘Just Give Me Jesus’. A song that challenges us to believe into the fact that God has always been there with us every step of the way, and that anything that we’ve needed of God, He’s always been for us; Unspoken continue to encourage, with a light acoustic and hand-clapping ‘Mistakes’, a song that reminds us that even our mistakes we often hide are used by the Lord in this big tapestry that He’s weaving throughout our lives in the hope that what we will discover about ourselves and Himself is something we can use to live life differently if required. Our mistakes are not what will hold us down , because of the enveloping grace that covers our lives, inclusive of the mistakes of the past, present and future. Unspoken finish off the EP with songs ‘Human Condition’ and ‘If We Only Knew’- ‘Human Condition’ is a realisation that the human condition of being in a rat race and wanting to look perfect and be confident all the time can seem like being a fake, and that God would rather us be vulnerable and broken rather than all-together and fake inside. ‘If We Only Knew’ ends the EP in declaratory proclaiming fashion, as we are reminded that if we knew of the level and magnitude of Christ’s sacrifice, we ought to live life knowing that He paid a high price for us to be united back to Him- surrendering to death itself! Just Give Me Jesus EP quietly is becoming one of my favourite EPs of the year, and if I hear the songs more times in the future, the EP could become one of my top 5 EP’s of 2018 thus far! That’s how powerful and hopeful, encouraging and poignant, the EP really is. As Chad and co. give us courage and perseverance to press on and ask the hard questions, to really allow us the space to think if we really can answer such a question honestly (whether we truly will be satisfied with Jesus and nothing else, or not); Unspoken have once again presented a winner. With the title track a very big consideration for WOW Hits 2020; this soul-pop band have shown us what a follow-up to a sophomore album, should sound like. Upbeat and enjoyable, fast paced, enthusiastic, energetic, lyrically poignant and hard-hitting, the EP is one that is very much needed now in a culture of comparison than it ever was before! Well done guys for such an inspirational and uplifting EP, looking forward to the impact it has on schools in the upcoming weeks and months ahead! Previous PostCaleb + Kelsey – Christmas TogetherNext PostFLASHBACK FRIDAYS: WEEK 31 (Worshipful albums)- Do we really need to be thankful for one day of the year, or should we have an attitude of gratitude all the time?